Hello! Thanks for stopping by to view my art. If you like the humorous, whimsical and colorful, you've come to the right place. Please click on my Portfolio tab above and check out my art. 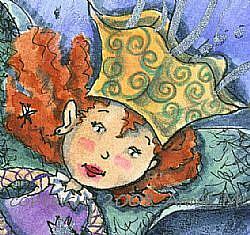 I have illustrated 6 successful children's books and love the whole book illustration process from start to finish. My illustrations in a children's educational book won a Women in Communications Communicator of the Year Award. I enjoy doing all types of illustration from greeting cards to spots, but most especially children's books. I combine digital and traditional materials in my illustrations, such as watercolor dye, India ink, colored pencil, the finest synthetic Taklon non-fur brushes, and PhotoShop. I use earth friendly re-cycled materials when I can. To see the Amazon page for one of the children's books I've illustrated, "Ellie's Room" by Kathryn Lynn Seifert, click Ellie's page and click on the author's names to see more books illustrated by me. Stop by my FaceBook page and leave a comment. Enjoy browsing all the beautiful art here on EBSQ.